In this Costa Rica Whale watching adventure package the whales are in charge with the task of drawing the attention of those visitors interested to learn more about the different whale that visit the South Pacific waters of Costa Rica. Learn about where they come from, how the families travel the oceans together and the different seasons when they do it. The Southern Pacific side of Costa Rica is recognized around the world as a breeding area for two groups of Humpback whales from different hemispheres. One of these groups comes from California, USA, while the other group comes from the south of Chile and the Antarctic. 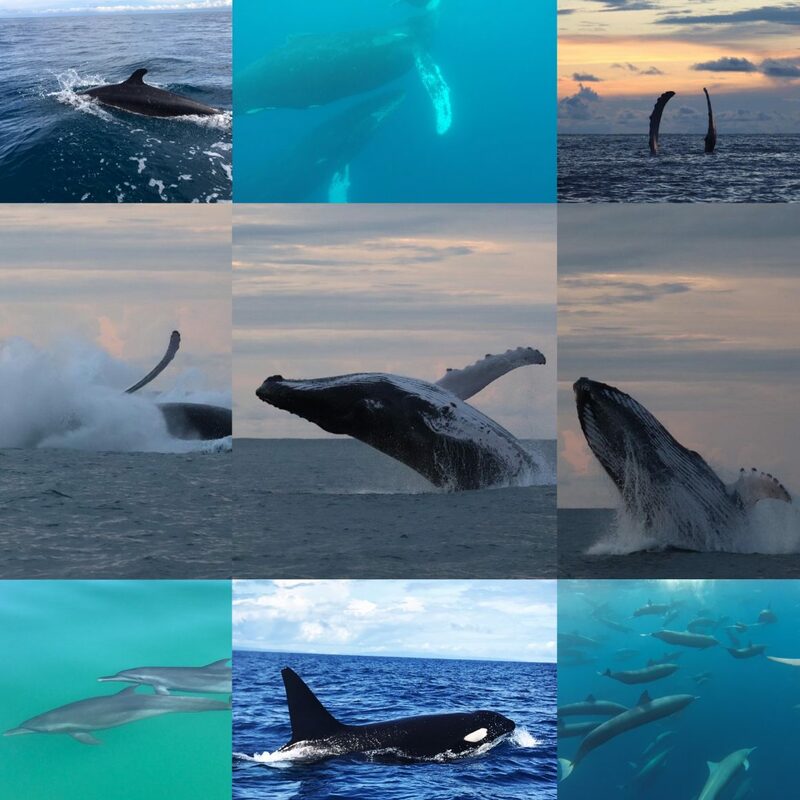 Also other whale species such as Bryde’s whale, Sei whale, Fin whale, Killer whale, Melon headed whale and have been spotted in our whale watching expeditions. Costa Rica certainly has an especial characteristic that makes it unique! Throughout the year visitors can also see enjoy unforgettable encounters with different dolphin species that reside the South Pacific waters of Costa Rica, species like pan-tropical spotted dolphin, bottle noose dolphin, common dolphin, and spinner dolphin just to name few. Our Whale and Dolphin watching programs are lead by professionally trained expeditions leaders that count with an extensive experience and knowledge of the whales and dolphins species that frequent our waters. What it does NOT include: International flights to and from San Jose, meals while in San Jose, and gratitude’s. Price per person $1495 based in double occupancy. + $ 510 single occ. (taxes included). Arrive in San Jose, Costa Rica and spend the night at recommended hotel in San Jose. Fly directly to Drake Bay and arrive at Hotel Ojala. Hotel Ojala has a great location just 15 minutes walk from the village of agujitas and only 5 minutes walk from the ocean. Rooms overlooking the ocean, are air-conditioned, the only such option in Drake Bay. Hotel Ojala also counts with an outdoor Jacuzzi. You will often eat the fish caught that day by the hotel owner who runs a sport fishing operation. Whale and Dolphin Watching. Tour starts at 8:00 am and ends between 2 and 3 pm depending on what we see. Lunch is either on the boat, Cano Island or at San Josecito beach where you can relax and snorkel. The tour will be guided by a local marine biologist, who has over 10 years guiding whale and dolphin watching expeditions. Whale and Dolphin Watching. Tour starts at 8:00 am and ends between 2 and 3 pm depending on what we see. Corcovado National Park – Sirena Park Ranger Station – this station is situated in the heart of Corcovado National Park. Its location is more remote, a 50 minute boat ride from Drake Bay, with a wet landing on the beach for which it is recommended that you wear sandals. Upon reaching the Sirena Ranger Station in Corcovado National Park, you will have the chance to change to more rugged footwear to hike some of the Park´s wildest terrain. The Sirena Station-Corcovado National Park hiking tour departures at 6:30 am from drake bay and returns from sirena at 1:30 pm.